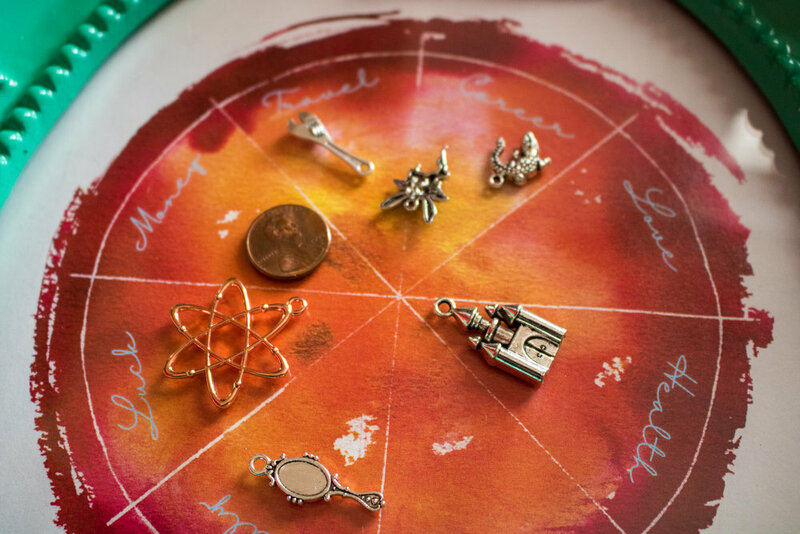 Charm casting is a form of divination during which charms, small baubles, and trinkets are gently tossed across a special chart created to depict different aspects of life. Each charm has distinct symbolism, and the area on the chart in which it lands can reveal surprising truths, dish up valuable insight, and, some believe, even predict the future as it stands at the time of casting. The charms used can be virtually any small objects that are able to be gently tossed. While I do have a collection of traditional charms I’ve bought over the years, many common household objects can be used in this form of divination in addition to (or in place of) actual charms. Buttons, beads, coins, small crystals, river rocks, rings, bottle caps, necklace pendants, and acorns can all be used to cast charms. After all, the objects themselves aren’t inherently magical; the magic is in the intent and symbolism you personally give each trinket. This charm indicates fate, luck, and fortune. Wherever it falls, good fortune is foretold. The odds are on your side. If there’s anything you should be betting on, it’s yourself. Don’t be afraid to step outside of your comfort zone now in the pursuit of whatever sparks passion and curiosity. This charm indicates misfortune or a bit of trouble in the area of the chart on which it falls. Never fear! Choppy seas are part of life. Just be sure to focus your self-care routines on this aspect of your life to restore energetic balance and get things back on track. This charm indicates happiness, success, and public recognition for accomplishments. Wherever it falls, expect good things. While victory doesn’t always come easily, the cards are stacked in your favor now. Persevere, and work through any obstacles in your way with dogged determination. You’ve got this! This charm may indicate energetic blockages or major life upheavals. The very foundations are shaken of the area of life on which this charm falls. While this might sound frightening, know that these tumultuous waters can lead you to new horizons and breakthroughs. Keep a level head, remember the importance of comprehensive self-care, and embrace the current chaos. It won’t last forever. This charm represents you, overall. Where it falls on the charm chart indicates where the majority of your energy is being spent in the current moment. Use this information to find balance in your life. Alternatively, this charm may indicate the area of your life on which you may need to focus a little extra self-care. The placement of this charm indicates the area of your life where critical thinking and logic are most required. Use your head more than your heart where it falls. Don’t let your day dreams carry you away now. Do what you have to do to keep a level-headed, practical perspective. Sensibility, not emotional responses, will save the day. The placement of this charm indicates the area of your life that could use a bit of emotional support and compassionate care. Are you being as tender, inclusive, and considerate as you should be? Remember to extend yourself the same compassion you show others. Take care not to isolate yourself now. Reach out to your network of support if you need to. Remember: asking for help when you need it isn’t a sign of weakness. It’s essential and brave. This charm represents a coveted, divine spark of inspiration or creation. It’s pure potential. It’s magic. Wherever it falls, expect epiphanies, new ideas, and exciting opportunities to bloom. Don’t let inspiration pass you by! If they align with your intuition, act on your impulses, take calculated risks, and pursue opportunities that come your way with an open mind. Endings are often feared, but this fear isn’t always altogether sensible. Endings are natural parts of life, and they often lead to bright, unexpected beginnings. This charm indicates the area of life where something is coming to an end. Whether it’s a job, creative project, friendship, or relationship, know that this transition is natural and fated. Let go with grace, and hold space for what’s to come. Begin by creating a sacred space. To do this, burn palo santo or dried sage in a fire-safe container, and let the smoke energetically cleanse the air. 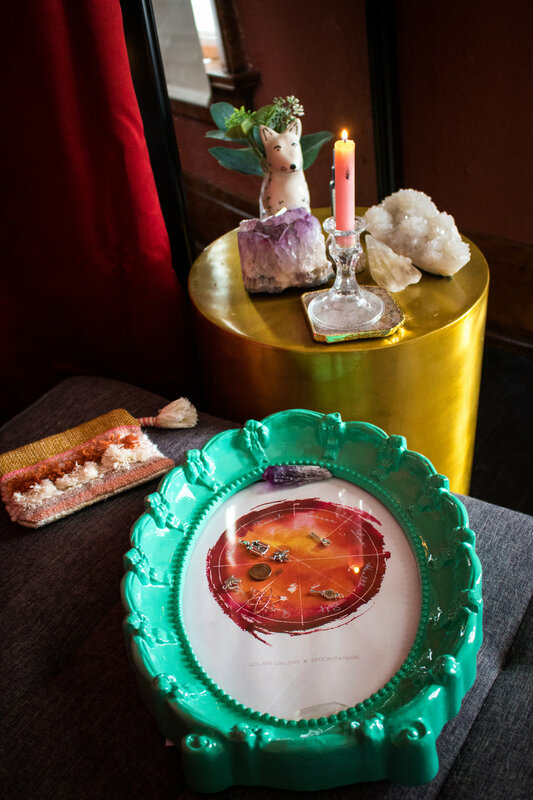 Alternatively, use your favorite purifying visualization exercise, or let the cleansing vibes of the crystal selenite radiate throughout your space. Next, gather a few crystals to help you connect with your intuition, such as celestite, amethyst, spirit quartz, elestial quartz, or Tibetan quartz. When your space intuitively feels ready, light a white candle to symbolize the beginning of the session. Lay your Solart Gallery charm chart in front of you on a flat surface. 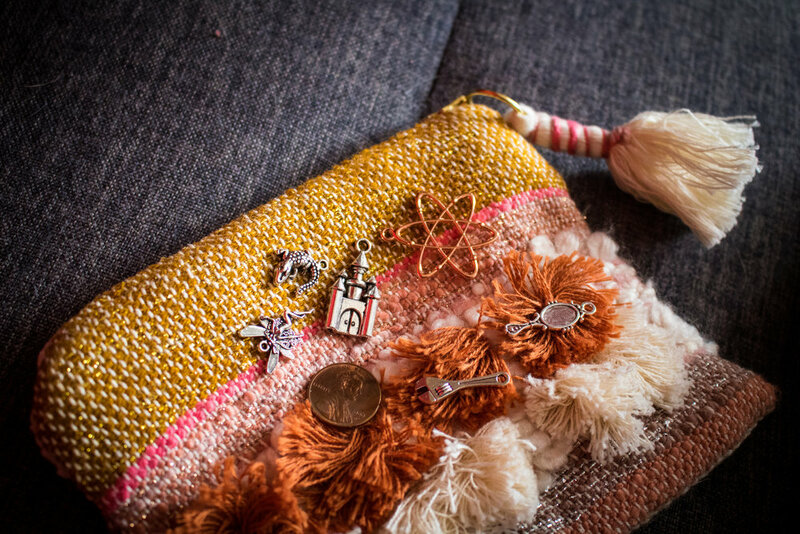 Gently shake your charm bag while focusing on a specific question, or, for a more general reading, concentrate on clearing your mind of clutter and manifesting your inner magic. *Remember, the future isn’t set in stone. It’s variable, and you have the power to influence it. Let charm casting give you hope, insight, and warnings, but don’t let unfavorable placements worry you. They’re just there to advise and guide you. Cheers!